Velomobiles are the vehicles of the future. Not only are they the most efficient vehicles in existence but they're also precisely what our planet needs now. They genuinely have zero emissions because you are the power source. With a velomobile you and your luggage can travel at speeds which compete with motorized vehicles while using nothing more than your own muscle power. Speed: The aerodynamic shell enables riders to maintain higher average speeds than a conventional bicycle. Range: Being able to go faster means covering a longer distance in the same time. Alternatively, work less hard and cover similar distances to a normal bicycle with less effort. Comfort: Sit in comfort on a seat designed to supports your back while the body shell provides protection from the worst of the weather. Safety: Three wheels vastly reduce the danger of ice or wet surfaces. Stability is not dependent on balancing. Velomobiles are particularly visible on roads. Praciticality: Carry your luggage with you within the shell. "Speed" for a cyclist is a relative concept. Bicycles have an unbuilt speed disadvantage next to motorized vehicles because they are dependent on making best use of the power available from their rider. An efficient bicycle allows a cyclist to go faster with the same effort. Because an efficient bicycle allows covering longer distances in the same amount of time, cycling becomes more competitive with motoring. Velomobiles make longer commutes, longer shopping trips and longer recreational rides into a reasonable possibility regardless of the weather - the body shell keeping you warm and dry in comparison with a normal bike. A velomobile makes it a pracitcal proposition for almost anyone to reduce their dependency on motorised transport and reduce their carbon footprint as a result. The one big problem with velomobiles has always been the price. Because all velomobiles and hand built in limited numbers they are expensive to buy. We are proud to be able to offer the lowest cost velomobile currently available: The Alleweder A4. Alleweders are a well established product in the Netherlands. At least 750 Alleweders have been built in total since their introduction in the mid 1980s and they have a good reputation for reliability. The A4 is the newest and most sophisticated version of the Alleweder and there are now over 350 A4s in use. An Alleweder gives you 90% of the functionality of any velomobile for a fraction of the cost. How long does it take to build ? An Alleweder A4 usually takes between 50-70 hours to build from the kit. People who are particularly handy build them in around 40 hours. You could build your Alleweder in a one week hoilday, or if you work on it only on weekends you could be finished in a month. This video shows the entire process condensed into minutes. By building the Alleweder yourself, you'll also learn how to maintain it. We recommend a major overhaul every 10000 km. This video shows the build of Alleweder A4 number 250. This gives a good impression of the parts which are included in the kit, many of which we also sell as separate parts. Note that the specification has varied over time and your components may not look exactly like those in the video. Some of the parts included in the kit are also available as separate items so you can see close up photos of them on other pages of this website. These include the comfortable moulded seat, seat cushion, head support, bottom bracket holder, large front chainring, chain idler and two mirrors. Simple front and rear lights are provided. We recommend an upgraded front light if you intend to ride at night. The kit comes with high quality composite wheels. We offer several options. The 9 speed derailleur version is simple to use with just one gear shifter and ideal if you live in a mostly flat area. If you live in a hilly area you may find that you want more gears so we then offer the 3x8 (3 speed Sturmey Archer hub combined with 8 speed derailleur) or Rohloff 14 speed hub gear versions. The Rohloff allows changing gear while stationary. You can also choose any other kind of gearing system with a 135 mm long axle which can be fitted into a 20" (ETRTO 406) rear wheel. If you wish to do this, please choose the kit without a rear wheel and you can then subsitute whichever rear gearing option you prefer and make you own wheel to fit the bike. Some people opt to add electric motors to velomobiles. You are of course welcome to make such an adaption if you wish to. Note that in many parts of the world approval is required for any electrically assisted bicycle which exceeds 25 km/h. We don't see motors as being helpful because most maintaining 30 km/h+ is relatively easy with human power alone when riding a velomobile. Please place your deposit using this webpage. The amount charged will be a deposit for the kit. When your kit is ready to be shipped we will invoice you for the difference in price between the deposit and the full price listed above plus the postage cost. The usual delay between placing a deposit and the kit being ready to ship is 2-3 months. By placing a deposit you reserve your place in the waiting list. If you need to cancel your order before the kit is complete please contact us and let us know. If no work has yet been carried out in producing your kit then we give a full refund, If your kit is already in production we wel will refund your deposit minus a 10% charge. Why build it myself ? Can't I order a complete ready to ride Alleweder ? 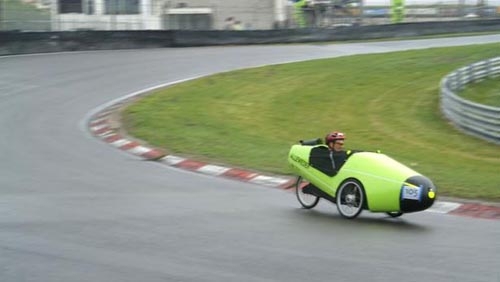 The biggest advantage of ordering a kit is that shipping to other countries is far less expensive to send the three boxes of parts which make up an Alleweder kit than it is to send a completed velomobile. Once we know your address we will let you know how expensive postage is to your location. Typically this figure will be under €100 within Europe and slightly over that figure outside of Europe. Mailing a complete velomobile costs well in excess of a thousand Euros which is why we do not offer that service. If you wish to buy your Alleweder as a completed ready to ride machine this is also possible. Contact us after placing the order for a kit. We will first process the kit order and then make a separate charge for construction (currently €2000). Note that you will have to collect the Alleweder from our address in the Netherlands when it is complete. What does Alleweder mean ? Alleweder means "all weather" in Dutch. The original design was built in the mid 1980s and it was the winner of a Dutch competition to design a 365 day per year bicycle. Why this method of construction ? Think of the Alleweder as a low-flying airplane: Bart Verhees, the designer of the original Alleweder, used the same same riveted aluminium construction for he Alleweder as he used for his unique kit aircraft designs. The Alleweder genuinely uses "aerospace technology" because its construction really is just like an aircraft and if you have a bit more time available you can still build one of his aircraft from a similar kit. The A4 is the result of many adaptions from the original design. Practicality of the finished machine has been improved but also the build time is very much reduced in comparison with the original Alleweder kit. In particularly, use has been made of a computer controlled milling machine to make many parts for you. Also the seat is much improved, made of a nylon/glass fibre mix instead of the builder having to make it out of aluminium. Can I have a different color ? We supply the Alleweder in its natural aluminium colour. It is of course possible to customize the appearance with a paint job or with stickers and many people have done this either by DIY or by employing a company which does car re-spray. How can I calculate how fast an Alleweder would go in comparison with my existing bicycle ? We have a webpage which allows you to calculate the speed of an Alleweder compared with other types of bicycle. Note that the aerodynamic effect is more pronounced with a headwind ("Wind Speed") and that you can of course improve the Alleweder speed by substituting wider high pressure slick tyres for the practical touring tyre that is the default. The website can of course only make approximations, but we find it to be surprisingly accurate. Riding into headwinds with an ease which is almost embarrassing relative to other riders is a normal experience for a velomobilist. Typical weight: 34 kg (varies depending on specification and how it is built). Size: 250 cm long x 81 cm wide x 95 cm tall. Rider size: As standard, suitable for people between 170 cm and 195 cm in height ( 5'7" - 6'5" ) but if you're building it for your yourself anything is possible. Guarantee: All major parts have a five year or 50000 km guarantee (whichever is reached first). Parts which wear due to use, or example chain, tyres, bearings, chain tubes, idlers, chainrings and suspension parts are not covered the guarantee and nor is any fault caused by incorrect construction.